This stunning, custom-built contemporary is perfectly situated on 6 acres comprised of 2 separate parcels with open sky views overlooking the spectacular banks of the Pine River. Soaring ceiling heights, numerous tall and transom windows, , expansive wall spaces perfectly suited for art and an open floor plan make this property truly special. An impressive entryway with a floating metal and wooden staircase introduces you to over 3700 square feet of sophisticated interiors filled with natural light. 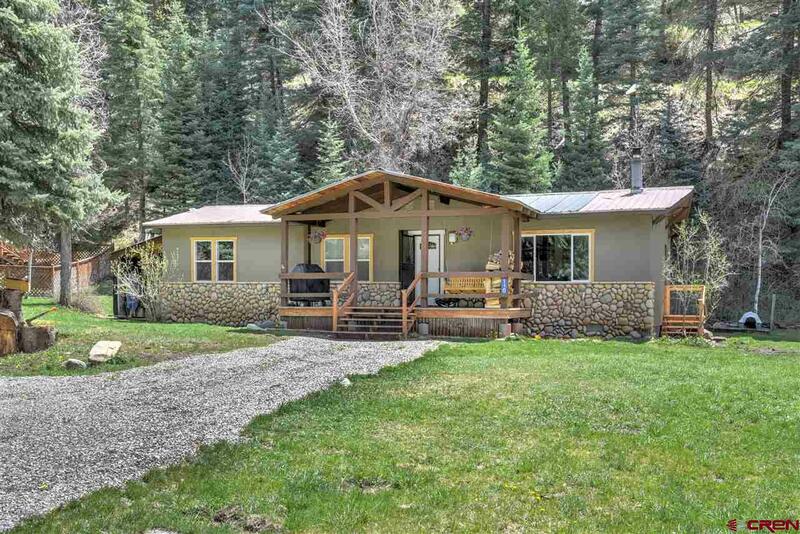 This 3-Bedroom and 5 Bath home has a river fed pond, a geodesic green house grow dome and irrigation rights in a private location convenient to all the amenities that Bayfield and Durango have to offer. The modern yet soothing kitchen, boasting European style soft close cabinets, poured concrete countertops, chef grade stainless steel appliances and large butlerâ€™s pantry, serves both the Dining Room and outdoor Covered Patio, complete with wet bar and woodburning fireplace. Great room features tongue in groove vaulted ceilings, sliding glass doors to patios overlooking river and Danish designed Morso wood burning stove. Off the kitchen there is wonderful mudroom complete with an elevated pet shower with dog door to a fenced out door area. The Main level Master Bedroom Suite with customized walk-in closet, steam shower, soaking tub, bamboo cabinetry and poured concrete countertops. Upper level loft with beautiful carpeting includes an wonderful office set up with built-in desk for two, floating shelves, windows for 360 degree views and large storage closet. The walkout lower level features additional den/living room with aggregate concrete flooring, large mirrored fitness area, mini-kitchen and two private en-suite bedrooms. The home features an oversized 2-car attached Garage. The detached outbuilding includes two additional garage spaces, one with a 12 ft high door allowing RV parking, a workshop and an outdoor covered area for firewood storage. 7 zone in-floor radiant heat, whole house air-recirculation system, water filter and softener, installed radon system and heat tape for gutters and roof on north side. 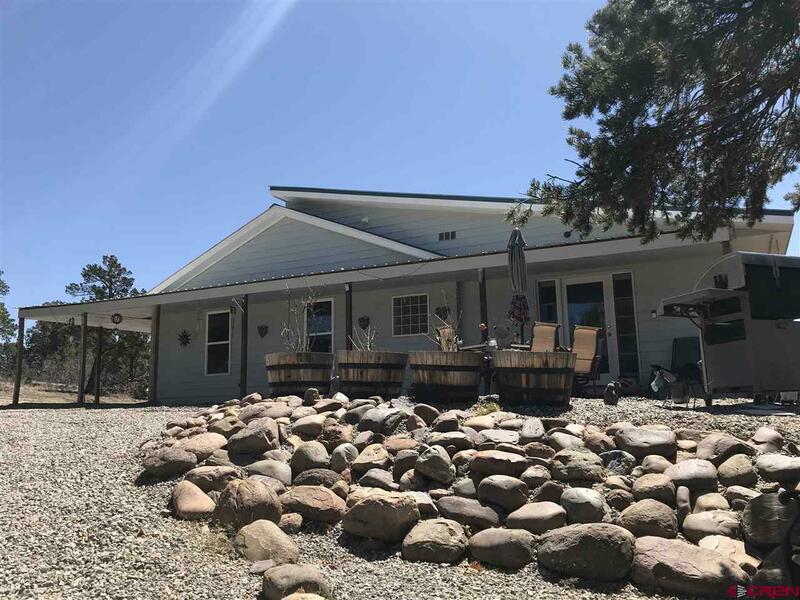 Perched on a hillside just a minutes drive (paved) from HWY 160, watch soaring birds and enjoy the views beyond the river, large ponds and mountain range. 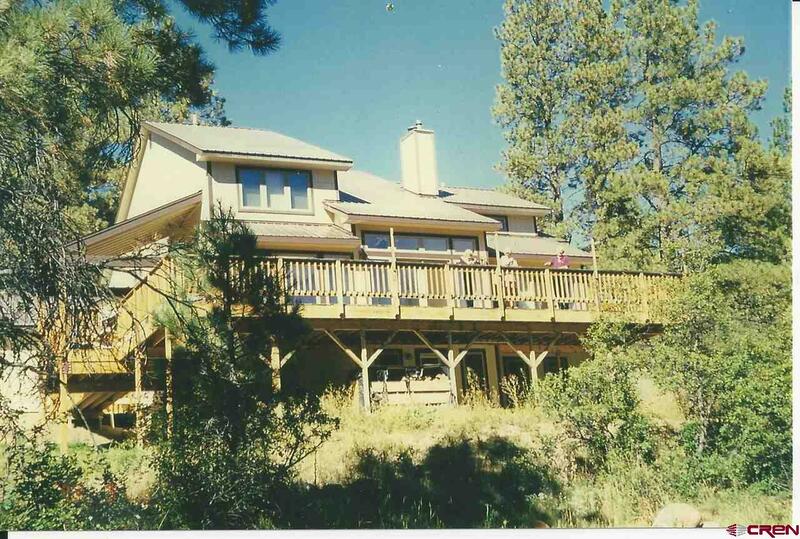 Irrigation - House: 2 acres PRID plus .05 share Thompson-Epperson ditch. Lot: 1 acre PRID plus .05 share Thompson-Epperson ditch. Propane -Amerigas 1000 gallon owned tank, Visionary Communications for WiFi.